Lightly spray your temp-tations® Lid-it® with non-stick spray. Bring pie crust to room temperature and lay on a lightly floured work surface. Unfold or roll out flat. Place pie filling in a food processor and pulse a few times until apple chunks are in small pieces. Spread over one crust, leaving a 1/4-inch borer around the edge. Lay second crust on top and press down gently. Cut into 1/3-inch strips and then into "French fry" sized pieces. Arrange in a single layer on your Lid-it®. In a small bowl whisk the egg. In a separate bowl whisk the cinnamon, nutmeg, cloves, ginger and sugar. Brush the "fries" with egg and then sprinkle with spice mixture. Bake for 15 - 20 minutes or until golden brown. 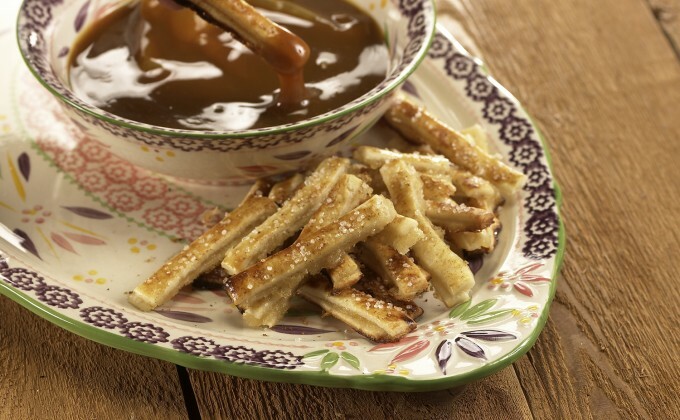 Serve with caramel sauce if desired.